Given that it's Halloween tonight and all, I felt like I should do something on horror games. Rather than cover one of the newer horror games (which, for the most part, we've already covered), I thought that I would instead go the exact opposite direction, and look at one of the very first attempts to do a TV console-style horror game on a handheld. 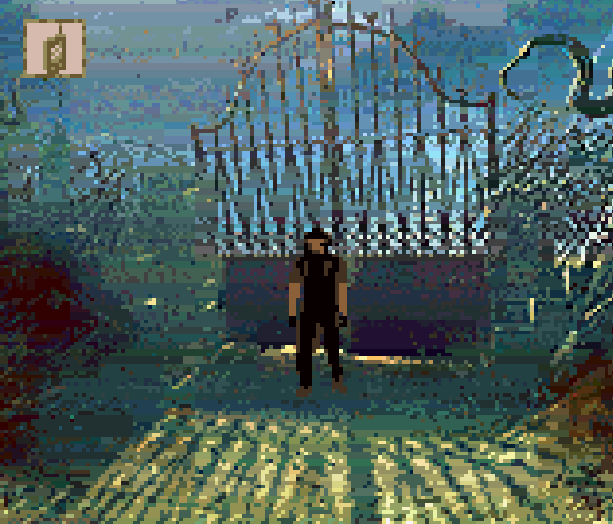 The game was Alone in the Dark: The New Nightmare, and oddly enough, I loved that little game. The name might be familiar to you, though you probably didn't know a Game Boy Color version existed. Alone in the Dark, itself, was a real pioneering game, and did what Resident Evil did, well before Resident Evil. The original was, in fact, the first properly 3D horror game, and thanks to the Lovecraftian theme that ran through it, it was actually quite the compelling game, back in the day. There should still be an iPad port of it available, though it's not the best port. 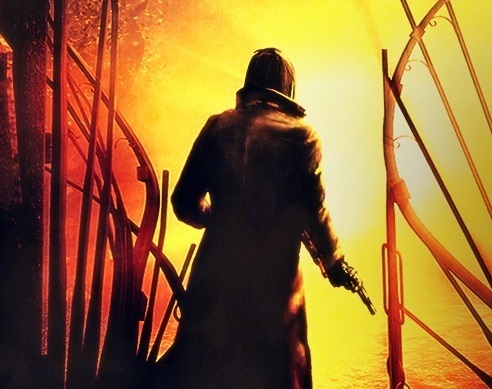 That first Alone in the Dark spawned into a franchise, which remained strong for three games before disappearing off the map. Then, back on the original PlayStation and Dreamcast, it made a return, as a very faint clone of the Resident Evil series in Alone in the Dark: The New Nightmare. There was later a PlayStation 2 port, and that was the one I played, but regardless of which version you played, the console game was much the same experience; explore levels designed like Resident Evil, fight enemies that could have been Resident Evil enemies, and solve puzzles that would have been familiar to anyone who played Resident Evil. The game lost a great deal of its Lovecraftian heritage, and aside from generally likable lead characters, was very forgettable. But the Game Boy Color version was notable. I don't think it sold well and I remember that my brothers had a nightmare (hah) of a time trying to find me a copy when I specifically asked for it as a birthday gift, but it was notable. It was notable because it was, as far as I'm aware, the one and only attempt to do a Resident Evil-style horror game with fully 3D environments to explore. It was, of course, a game that was compromised in just about every way from the console version; areas were smaller in size and the FMV cut scenes were removed, but what was in the game really was fully 3D environments to explore and a fully 3D character to move around. Combat was where things changed. When combat was entered, the game would shift to a top-down perspective, and you'd have to fight the enemies in that space, a little like in a dual-stick shooter. Only, of course, you didn't have dual control sticks to play with. Simplified down as it was, it was still an interesting combat system, and did a good job of conveying the basic horror principles of scarce ammo and deadly enemies. Despite that I do remember wishing that the game didn't have the combat at all. I guess I was partial to the idea of a walking simulator all that time ago. I remember simply having so much fun wandering around and exploring the decrepit mansion, and being so absorbed in the simple idea that here I was playing a full 3D game on a handheld device, that the combat didn't really phase me. Was it actually scary? No, not really. There's only so much fear you can pack into fuzzy blobs and hazy backgrounds. Once upon a time Capcom canned a Game Boy port of Resident Evil itself because, though the developers had managed to get the game working, Capcom believed that it lacked the fear factor, which people wanted for the series (at least, back then). I don't blame them, looking at Alone in the Dark's Game Boy Color. At the same time, though I wouldn't call it horrific, I would quite happily say that it was atmospheric and gloomy, and actually an impressive example of art direction within the most severe of technical limits. Back in the day, the Game Boy Color was considered a real creative challenge by some developers, who managed to eke some things out of it that shouldn't have been possible. Alone in the Dark is certainly an example of this. That original attempt to bring the original Resident Evil to handheld wouldn't be achieved until the Nintendo DS came out many years later, and to this day developers have really struggled to achieve anything of worth with regards to horror on portable devices. It's only really with the iPad and Nintendo Switch that we can say the genre is regularly there. So bringing a horror game to the Game Boy Color in a way that, if anything, bettered what its home console counterparts achieved was truly impressive. The game was a couple of hours long, had none of the tedium of its home console counterparts, and managed to create a workable combat system without compromising on the goal to have players explore 3D areas. If only Infogrammes were still around, we might have seen the game land on the Nintendo 3DS Virtual Console or similar.